How to do more work that makes you happy. Sitting enjoying a coffee and catch-up with a friend and fellow business owner, I was surprised to see this normally bubbly and energetic lady physically slump in her chair as soon as we started talking about work. I know she loves what she does and is really good at it. Further enquiry uncovered that she was busy being caught up in admin rather than spending time on the things her business delivers with such excellence. Her situation resonated with me – and I wonder if it does for you, too. We start our businesses to do more of the things we love but, paradoxically, we find ourselves consumed by the many other tasks involved in running a company. If, for example, you are a web designer or an artisan maker, you probably started your business to spend time designing and making rather than finding new customers. As a photographer you probably intended to spend most of your time taking photos, not doing your accounts... I could go on but I suspect you get my drift! The impact of doing those tasks which steal our happy was evident when talking to my friend, who was clearly affected both physically and emotionally. And this can damage the very core of our businesses because absolutely key to our success is the passion and energy we find when we are doing the things we love. As small business owners, it is very tempting to think we have to do everything ourselves, but is that our only option? Could we be asking ourselves: “Should I outsource?” Is there a way to do more of what makes us happy? The answer is yes, we do have an option which will allow us to focus on doing more of what we love. In some ways, making that happen is easy but, like many things, it may not seem that way at first. You may well not want to hear this but, unless you are a leading expert in all areas of business, this quite simply is not true. As the proud owner of a business you have built from nothing, it is understandable you might feel that way and, yes, there probably are some things that only you can do – but what about the rest? Why invest time in learning about tax laws, for example, when you could work with a specialist and get better results in a fraction of the time? Why slave over an administration task you find difficult when you could draw on the skills of someone who loves doing that very thing? This may be true when you first meet the people you are going to get to support you – but you can change that. As a bonus, in the process of explaining and discussing your business, you will almost certainly come up with new ideas and ways of doing things better. The combination of their specialist insights and your knowledge of the business can be very powerful indeed. Again, I would challenge this assumption. What happens if you flip it on its head? Can you really afford not to? You are a valuable resource and your time is best spent on the things which add the most value to your business – whether that is your time creating or your time with clients. Don’t sell yourself short. If you could make £500 an hour when you are with a client, it could be worth investing in three hours of childcare to enable you to do that. Whatever your business, there are likely to be tasks which make you ask yourself: “Should I outsource?” For example, you might want to pay someone to do your social media or website updates so you can focus your energies on making your products. If you absolutely can’t find the cash when you are starting out, how about an exchange of skills? This works particularly well for service businesses – how about exchanging a haircut or a house clean for some bookkeeping? This is time to put your ego to one side and answer honestly as these are the core things you should never trust to somebody else. Personally, I would not delegate my coaching hours, but cleaning my coaching space – with pleasure! 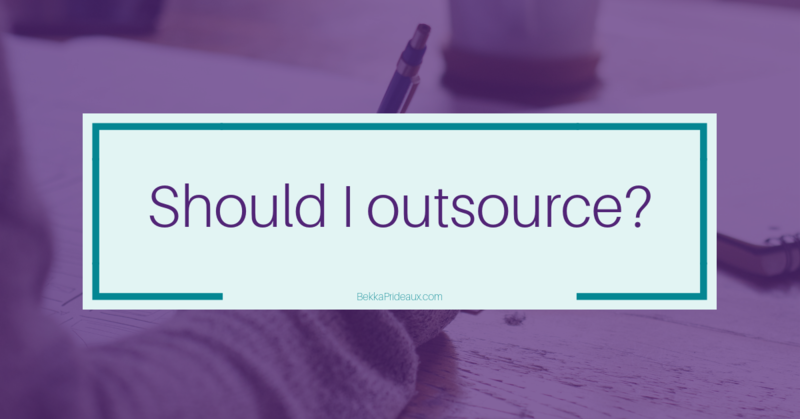 You may find yourself left with a long list of things which make you ask “should I outsource?” and your next challenge is to work out which ones you could outsource. My top tip is to start with the things you dread doing. These are the tasks which steal your happy the most; they drain you and take more of your time than they really should. Yes, you need to find the time to make the outsourcing happen and, yes, you need to make sure you find the right people to delegate to with the right and mutually beneficial arrangements in place. But the renewed focus and passion, the renewed balance, and the overall financial benefits will soon kick in. I encourage you to look at those things that steal your happy, that keep you away from the things that only you can do and ask yourself “who could do them better?”.